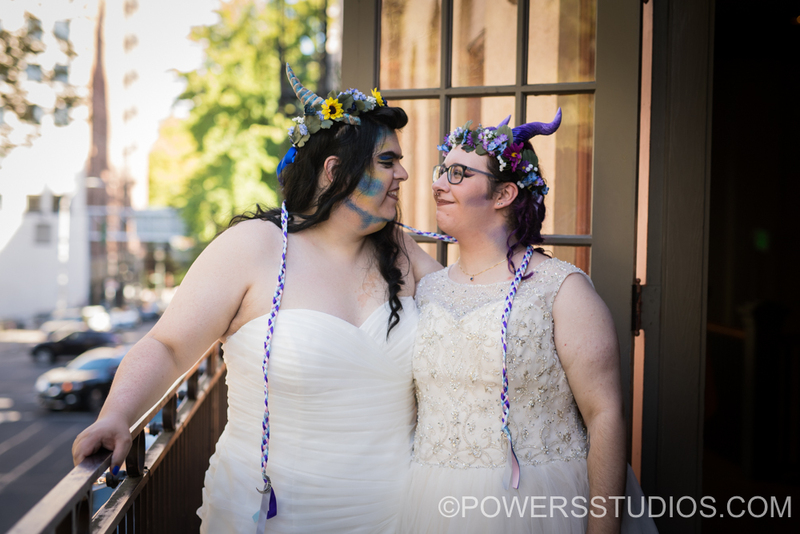 Emerald and Lilith enjoyed a heartwarming and intimate wedding at The West End Ballroom. Dragons was the theme from their centerpieces, to cake topper, to dragon scale inspired makeup and horns each of them wore. They are also huge fans of Dungeons and Dragons, a common bond they share with a number of their friends who attended. The ceremony was Pagan, and centered around invoking deities, with each invocation, a ribbon was tied to a staff, which they both held. As a couple, Emerald and Lilith very much embody the dragons that were the theme for their wedding day. There is wisdom, timelessness, they love each other fiercely and without reservation. They balance one another so well, and together I believe them to be unstoppable. Congratulations once again Emerald and Lilith!